« Convention 2011! What an absolute hoot! 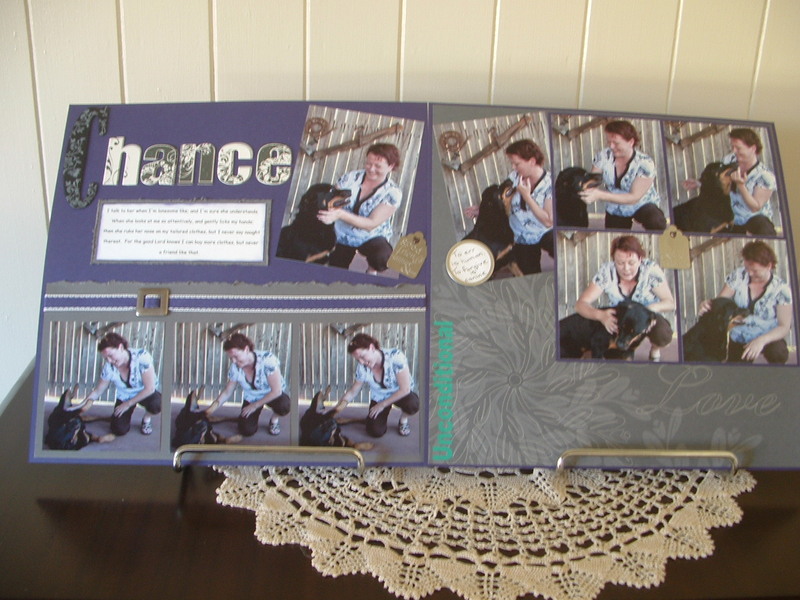 Scrapbooking, I’ve discovered, is a very emotional thing to do. 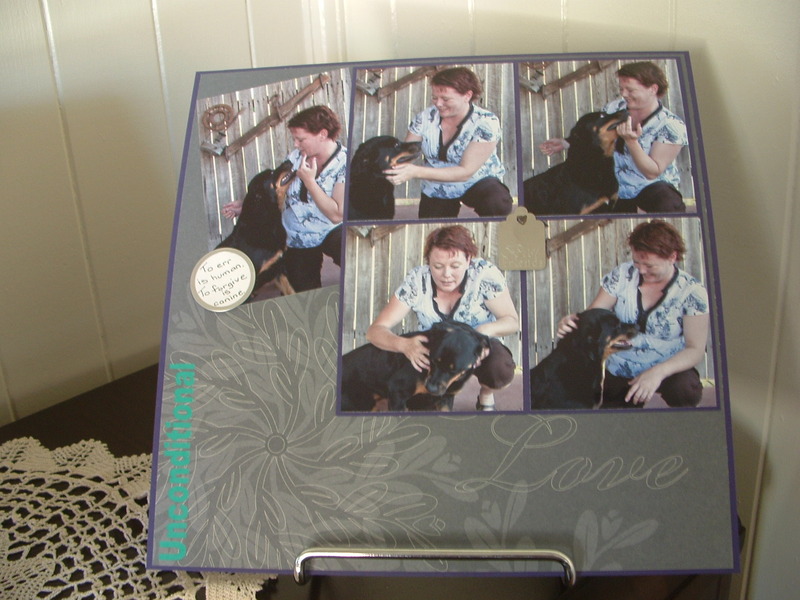 Prior to going to Melbourne for convention I’d ordered some photographs and they were here when I returned. 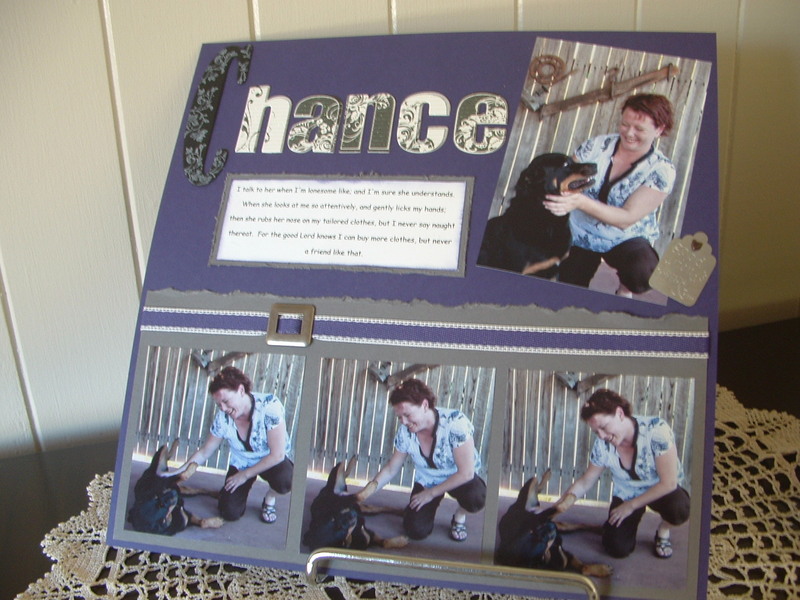 When I opened the envelope and saw these pics of our daughter, Aedita and her gorgeous Rotty, ‘Chance’, I just wanted to sit right down and scrap them immediately. These pics were taken about two years ago and during that time ‘Chance’s’ health has deteriorated somewhat. She’s now an old lady and demands that she be treated as such! Chance has been Aedita’s friend for such a long time. Together they’ve been through much. Crazy I know, but I did shed a few tears doing these two pages. My goodness I love that dog! We don’t see her a great deal but whenever we visit she is so very pleased to see us and lets us know it too, as only ‘Chance’ knows how. I’ve not scrapped so many photographs together for a long time so this was a bit of a challenge, however much like ‘riding a bike’ once I started the ideas come flooding back. “To err is human. To forgive is canine”. How true is that. We Crouchs are such dog people. We love our fur babies so much that Dennis and I even cut our Melbourne trip short because we missed our Monty, Jilly and Pickles very much. Watching the weather and the temperatures at Tenterfield that week didn’t help either. We had a series of -5’s and whilst they have great fur lined coats, heated beds, and an attentive minder, I couldn’t help but think of them without their Mum and Dad’s hugs, so we came home early!!!! Also at convention whilst other demonstrators gushed over each other’s photos of their children, Michelle Frost-Stevenson (Frosty)and I gushed over the photos of her new fur-baby. How crazy are we???? Please don’t answer that! I love to read your comments on the work that I post to my blog so don’t hesitate to leave me a comment. I have another technique class next Friday here in Tenterfield. We are covering heat embossing, so I must stop this scrapbooking thing now and get on with the preparation for that class. Be sure to come back and check out what we will be making. Until then. Stay happy and keep stamping! I love these pages Jacqui!